2008 is going to be remembered as one of the worst years in the stock market, and for good reason. Most major indicies posted losses of 30% to 40% for the year. If you’re invested heavily in stocks, you’re well aware of how badly this reflects on your portfolio. While the first three quarters of the year were pretty ugly, the declines were relatively slow and steady over the course of time. But in October, we saw the most damage done with a substantial drop and subsequent volatility that really put an exclamation point on 2008. So, just how much of an effect did the 4th quarter have on 2008? As you can see, 2008 paints a pretty grim picture. 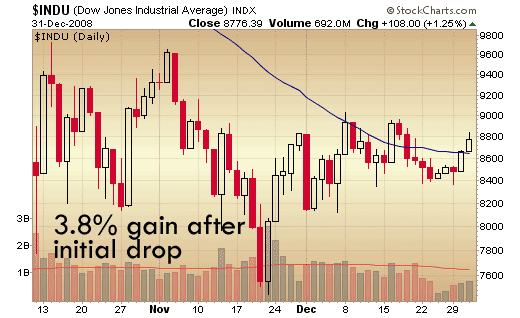 We started the year with the Dow up around the 13,000 range, and closed a little under 9,000. But if you look at the chart above, you’ll notice a few things. First is that the early half of the year wasn’t so bad. We did see a decline in up until March, but then quickly recovered most of those losses in just a few months. Then during the the early summer months we experienced a fairly significant drop until things leveled off until late September. And then the calendar flipped to October, which is also the start of the 4th quarter, and things got ugly real fast. You’ll notice that significant drop of nearly 2,500 points in just a little over a week. So, let’s zoom in on the 4th quarter specifically to get a better view. Most statements you receive in the mail are based on a calendar quarter, which means your 4th quarter statement should cover October 1st through December 31st. 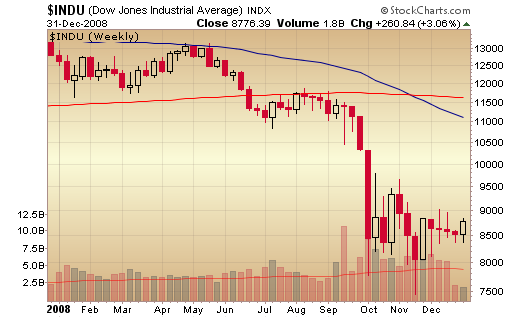 So, I’ve zoomed in on the DJIA to cover this period, since this is what will ultimately affect your 4th quarter numbers. Looking at the chart above, you’ll notice that the first few days in October did the most damage. 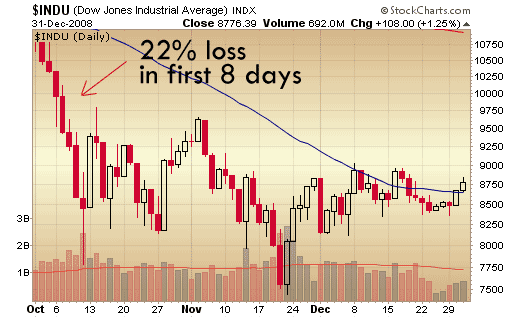 In fact, the first 8 trading days in October the DJIA lost 22%. Of course, the very next day after that string of losses the market rebounded nearly 10%, but that was only the beginning of what was to become an extremely volatile few months. If you ignore the initial 8 days, you’ll notice that the quarter ended nearly flat, or even up slightly. Of course, ignoring data doesn’t make it go away. But how would your statement look if it started on October 10th? When you subtract the first week and a half, the chart looks completely different. In fact, October 10th through December 31st posted a 3.8% gain. When you get your statement and see a significant loss, you can blame the first few days in October. Again, the losses are real, and you can’t just wipe out that first week. But I did want to show this breakdown for a reason. That’s because that first week of October shook a lot of people out of the market. By Friday, October 10th, I saw a record number of people coming to me wanting to move everything into cash. That’s fine, you can do whatever you want with your money. But what I like to point out is that if you already waited to see a 20% drop in a little over a week before selling, you missed the boat. Consider someone who got out on October 10th and put their money into a cash account. How much would they have gained by the end of the year? Probably just a fraction of a percent. Had they left their money where it was for the remainder of the year, they would have made 3-4%, which is much better than the likely 0.5% their money market would have returned. And this doesn’t even take into account the two and a half months you would have been continuing to buy into the market at these relatively low prices. Of course, hindsight is always 20-20, so it’s easy to make that call now. Ultimately, a loss is a loss. It doesn’t matter whether a 20% quarterly loss took place slowly over the course of three months, or if it all occurred within a few days, the end result is the same. But, it’s also important to look beyond the number and see why it occurred. If you let a few bad days force a market timing decision, you could miss out on recovering some of those losses by doing nothing. You could also miss out on a lot of buying opportunities if you’re investing on a regular basis through a systematic investing plan such as a 401(k). This just goes to show you how fast the markets can move, and for most people, by the time you get around to making an investment change, the action is over and you’re late. Without a crystal ball, the best you can do is hope that you’re right. That being said, could we see another year of sharp losses? It’s certainly possible. At the same time, 2009 started out up 3% in just one day. So before you open up that statement and get sick to your stomach, you should look at the big picture. Invest smart. Create a diversified portfolio that you’re comfortable with and invest regularly in all market conditions. If you get worked up about what a few bad days in the market can do to your returns and base your investment decisions on that, you’ll drive yourself crazy, and probably find yourself realizing worse results over the long haul. Would like to know if I can transfer a portion of a mutual fund ira to an individual stock and still be considered an ira without having to pay income tax on it until I sell the stock? Great post. Must also say thanks for the use of graphs and its subsequent breakdown in days. Like bills said, " Believe it or not, the biggest stock gains or loss happens in only a few days. I'm so thankful I wasn't over-leveraged myself, althgouh I did have to do some mammoth re-organization. The size of the drop caused a lot of people and funds to have to emergency liquidate to fund margin-call or customer withdrawals. I think this mangified the drop big time. As soon as investors get a litle money they're going to throw it back in. Took a look at your blog. Was a fun read for a few posts, I'll have a better look later. Your description could be me ... Forays into the stock market, property, angel investment. Very cool! Are you from Canada? Short-term volatility plays are a great way to make some day money esp now, but there are probably still some huge one-day drops in the market lurking in some of the companies you mention. Have you compared the results day trading versus a longer strategy? I used to do exactly what you wrote about, using oil mostly but switched to a horizon of a few months to a year. I was picking up a couple hundred volatility dollars a day while taking big risk, but the returns are greater holding for longer and the taxes are lower. That's only what I think. 2007 was a fantastic year as was H1 2008. We'll see what 2009 holds. My play fund shrank so I don't have as much room, but now the previous picks just seem that much better. 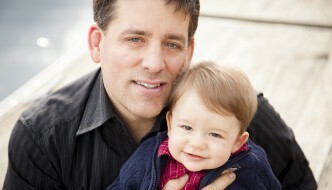 You input is valued and I appreciate the discussion! With your regards on #2, I think we can all agree that has happened at one point or another. With margins calls, that is the reality of the game dont you agree? Hopefully Q3 the job numbers can start to rally and pump some confidence and give us some better rallies though right now isn't a bad time, esp for day traders. 1) I don't know why anything changed in the way stocks were valued. I missed that information. I continue the same as I have been, and I haven't noticed most of the FP bloggers doing a big about-face, they just keep talking about allocation and business cycle. That's good advice and what I use for 75% of my stock market money. They rest is play, and I can afford to lose it. 2) You don't know the news and I am terrible at predicting bottoms or tops. In fact, lots of the time when I sell things get better and when I hold things get worse. I just set a plan and hold until the plan is fulfilled, which is often medium term - maybe 1 year. I do worse when I change the plan. 3) I don't use stop-losses. But I did make money day-trading when everyone else's stop-losses stripped during the various free-falls. Not to mention their forced sells due to margin call and being over-leveraged. 4) I don't look at indicators. I don't know of any reliable ones. Money press is worthless. 5) I already injected a little extra capital into a couple of speculative plays and they've returned 50% already. My advice? My general feeling is that banks will return first. They've been decimated and no there's nothing to do but make money the same old way they have been through fees off the backs of consumers. Brokerages especially will start to make money as the traders come back. As soon as businesses start to recover at all they'll shoot up like rocket ships. I'm also buying a couple of mining companies because metals are in the toilet and I believe they're too low. Again, base materials are going to be required immediately upon recovery. Spring is coming and that's when things will start happening. Little spurts at first and increasing towards the end of the year. There will be some very big up days this year and if you're waiting on the side for indicators then you're going to miss them. It's going to look flat and depressing and then BAM! a big jump, some more flat boring, BAM!, flat. Like that. Just keep the money in during the boring and sad times. -what is a reasonable value when the whole global economic climate has changed the way stocks will be valued from this point forward. -why would you not have sold when you know the news was to get worse from Sept - Dec. Its was not a surprise to all when stocks were in free fall, a stop loss should have triggered an exit point from which you could re-evaluate your financial strategy..right? Then you could have sold at a 10% or whatever loss compared to a 50% loss, and then ride the spikes now. That is called profiting. -the stocks did not go down 50% overnight, but did have steady steep declines from the socks I can see. Unless your referring to FRE/FNM which disappeared overnight (which is rare regardless of the media manipulation) people that are investing their money should have taken the time to look at key indicators and know its better to get out and wait. -if you are one of the people that some how slept under a rock, maybe I can see the point of keeping your money in the stock now and hoping to god that one day BAC/C/GS/AAPL or whatever big stock will come up to what you paid for. Its going to be a long time for returns of 100% to come back. Since you feel there is a rally going on, I am interested in picking your brain and hearing what 5 stocks you feel are poised to pop back to previous highs. #1 I think that if a stock goes down 50% then it can go back up the 100%. It was valued "reasonably" before, therefore I have to trust that reasonable value. #2 Maybe the high value did turn out to be unreasonable but the current low value is now reasonable, so how can you justify selling? #3 By the time you find out it went down 50%, it already went down. I say again, people have to keep the money in play to catch the big up-spikes. Missing the up-spikes by playing it safe then returns go way down. some stocks that were sold during their declines are better off doing so in my opinion. The way I see it, those that have stuck with their portfolio without changes during their turmoil are going to have to wait years before their values get to even and then they can think about all the time wasted not making money. For instance, when RIMM (or APPL) was declining, some days it did fall more than others but if you got out in mid-sept during the "crisis" you would have got a smaller loss and be able to buy back in later when the rallies began. I know this might not fly for all stocks, but investors need to remember, for a stock that goes down 50%, you need to have it rally 100% before you break even, kinda seems like a long shot if your going to sit in the same company hoping for those few "big rallies"
Great analysis! I'll be linking to it from my blog. Right on Bill. You have stay in play because you need to catch the surprise gains. Without the 10 or so biggest rising days in the market in a year the rest of the 355 don't return much, but you don't know when they'll come. You'll be extremely sad if you get hit by the surprise losses but miss out the surprise gains. I'm trying to remember the book that explained it the best and I think it was "Fooled by Randomness". Great job on the post. Love the graphs and breakdown of the actual days using the graphs. Thankfully, I was able calm my clients for selling frantically. If you are in the market, you have to remember why you were in the market in the first place. Also, if we could borrow your knowledge and have you become a contributor, we would be much obliged!!! Believe it or not, the biggest stock gains or loss happens in only a few days. Amazing how that can happen. Thankfullly I won't be needed this money any time soon. Maybe I can take advantage of the lows and buy even more for the future.